WORLD'S FAIR GRAND ROLLER COASTER. Riders in the red, yellow and green cars race down the extended track of the Cyclone, weaving in and out of the pillars featuring color-changing LED lights. Choose between 25 favorite Christmas carols or 25 beloved year round classics using the selector switch on the back panel. Press the New Song button to skip to another song. Christmas carols include "The First Noel", "Silent Night", "Jingle Bells", "Away in a Manger", "Deck the Halls", and 20 others. Year-round songs include "The Liberty Bell March", "Parade of the Wooden Soldiers", "Stars and Stripes Forever", "Blue Danube", "Can Can", and 20 others. Full volume control, including no music at the minimum setting. Adapter operated 6VDC 600mA included. Any questions, please don't hesitate to ask as I will be more than happy to answer. Thanks so much for looking! 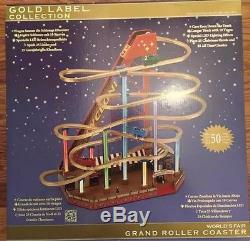 Christmas Gold Label Collection World's Fair Grand Roller Coaster NIB" is in sale since Sunday, May 14, 2017. This item is in the category "Collectibles\Holiday & Seasonal\Christmas\ Current (1991-Now)\Other Current Christmas Décor". The seller is "djnitro1981" and is located in Worcester, Massachusetts. This item can be shipped to United States, Canada, United Kingdom, Denmark, Romania, Slovakia, Bulgaria, Czech republic, Finland, Hungary, Latvia, Lithuania, Malta, Estonia, Australia, Greece, Portugal, Cyprus, Slovenia, Japan, China, Sweden, South Korea, Indonesia, Taiwan, South africa, Thailand, Belgium, France, Hong Kong, Ireland, Netherlands, Poland, Spain, Italy, Germany, Austria, Russian federation, Israel, Mexico, New Zealand, Philippines, Singapore, Switzerland, Norway, Saudi arabia, Ukraine, United arab emirates, Qatar, Kuwait, Bahrain, Croatia, Malaysia, Brazil, Chile, Colombia, Costa rica, Dominican republic, Panama, Trinidad and tobago, Guatemala, El salvador, Honduras, Jamaica.